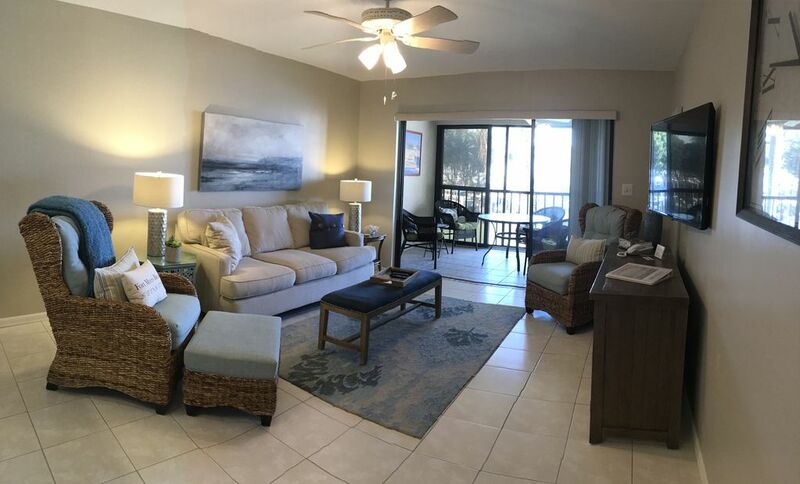 Our cozy condo is located on the southern end of Estero Island, in the Estero Yacht and Racquet complex. We are located on a wide canal near the Fish Tail Marina and Santini Plaza. This second floor unit has a great view of the canal boat traffic and wildlife. We have seen manatee and dolphins swim up the canal. We are on the second floor and there is not a elevator so steps may be a consideration for you. The unit has recently been remodeled with new furnishings and both bathrooms have new tile, tub and vanities. We enjoy the large patio many evenings grilling and watching the boats return to the marina. Our community is small and the other guest and owners very friendly. Several good restaurants are within walking distance and the trolley can be used to head to Time Square for a evening out. We purchased this unit for a get away from Minnesota winters. We are renting it out since we are not quite ready to retire but hope to spend more time here each year. We have 3 grown children and two grandsons who have all be able to come and enjoy this area. This property was recommended by a real estate agent, and he hit a home run! We love it here, many of the owners have been here 20 years. Many or the renters have rented here for 10 plus years. The neighborhood is close to dining, entertainment but on the south end of the island. We don't have quite the traffic Time Square does, but you can certainly get there easily. We come to relax and rejuvenate, warm up and just enjoy life. The views and proximity to the beach without the high cost of being right in the beach. It is a short walk we do everyday we are here make this place so special. Plenty of soft towels available for your use. There are also towels to use at the pool. Bedding along with an extra set if needed. There is a onsite coin operated laundry room. Towels for bathing and beach! Setting for 6 included - glasses, bowls, salad plates. Dine on the lania and watch the boat traffic and wildlife as you enjoy your morning coffee or a meal. There is a rental agency for both at the marinia. Nearby there are 75 courses to choose from. The best heated pool on Estero Island and a true gathering spot for the community. Tastefully decorated and fully equipped condo, Steps from pool area and Laundromat. Enjoyed watching fishing boats to yachts motoring past intermixed with Dolphins and Manatee's. Walking distance to shops and restaurants. This is a beautiful condo and the owner has thought of everything! We were very comfortable and enjoyed Fort Myers Beach very much. Loved it we will be back!